Model SMLA-TC of field configurable limit alarms with thermocouple input offers wide ranging inputs and flexible setpoint capability. It accepts six popular thermocouple types with inputs ranging from -270°C (454°F) to 1760°C (3200°F). The SMLA-TC provides two independent setpoint alarms (2 SPDT, 5A) and includes 0.25% to 50% adjustable deadbands and selectable 120/240 Vac power. Model SMLA-TC is equipped with a dual function diagnostic LED. The green center LED indicates line power and input signal status. Active line power is indicated by an illuminated LED. If the center LED is off, check line power and the wiring connection. If the input signal is above 100% full scale, the LED will flash at approximately 8 Hz. Below 0%, the flash rate is approximately 4 Hz. Setpoints are top accessed multi-turn potentiometers. 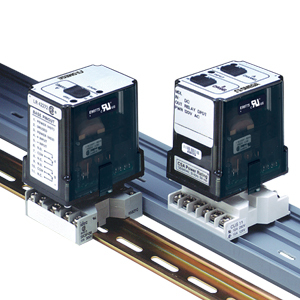 The field configurable SMLA-TC limit alarm setpoints can be configured for HI, LO, latching or fail-safe trip operation. Non-latching HI and LO setpoints have respective HI and LO deadbands. In a tripped condition, the setpoint is exceeded and the appropriate red LED is lit. The trip will reset only when the process falls below the HI deadband or rises above the LO deadband. To reset a latched setpoint the signal must be in the safe region and the line power must be turned off for at least 5 seconds. For proper deadband operation, the HI setpoint must always be set above the LO setpoint. In failsafe operation, the relay is energized when the process is below a HI setpoint or above a LO setpoint (opposite for non-failsafe). In the failsafe mode, a power failure results in an alarm condition. When switching inductive loads, maximum relay life and transient EMI suppression is achieved using external protection. Place all protection devices directly across the load and minimize lead lengths. For AC inductive loads, place a properly rated MOV across the load in parallel with a series RC snubber. Use a 0.01 to 0.1 mF pulse film capacitor (foil polypropylene recommended) of sufficient voltage, and a 47 Ω, ½ W carbon resistor. For DC inductive loads, place a diode across the load (PRV > DC supply, 1N4006 recommended) with (+) to cathode and (-) to anode (the RC snubber is an optional enhancement).